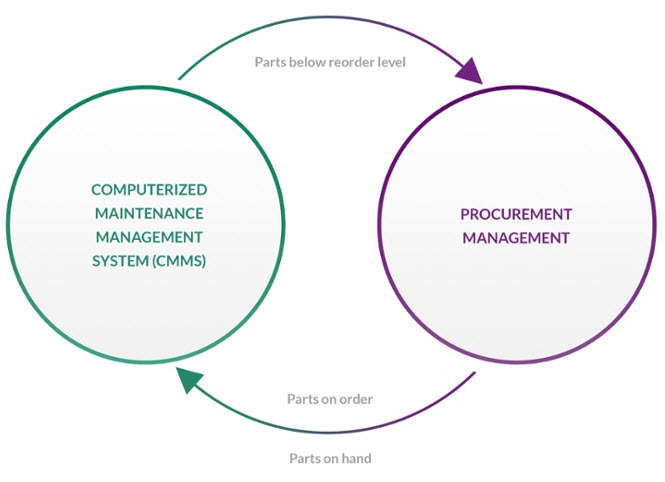 We recently introduced you to the concept of Closed-Loop MRO Procurement. We continue the conversation here with more information about the associated benefits. Traditionally, maintenance shops run their Parts Below Re-Order Point report once a week. They hand it off to the buyers who then place the orders for those parts. Unfortunately, sometimes that week interval slides to two weeks. And the orders are not always placed in a timely manner because the buyers have to manually create the RFQs/POs and figure out who to send them to. As a result, it can be weeks between hitting a re-order point and receiving replenishment parts. During those weeks, the remaining inventories can be depleted leading to stock outs. In Closed-Loop MRO Procurement, the buyers know within hours when parts drop below their re-order points. The associated RFQs/POs are automatically created for the buyers, allowing them to quickly work the orders for those parts and ensure that they are re-stocked as soon as possible. Replenishment can happen in days – not weeks. As a result, there is less of a risk of parts outages. When there are fewer parts outages, there is less of a need for overnight shipments. With Closed-Loop MRO Procurement, you see lots of UPS Ground on the delivery dock with very little, if any, UPS Red. As a result, shipping expenses are lower. Remember the delay between hitting re-order points and the receipt of replenishment stock mentioned above? This often leads maintenance teams to set their re-order points artificially high – just in case. It makes sense, right? Better to have too many parts than not enough. Unfortunately, this results in companies investing more working capital than they need to in inventory which also results in higher depreciation expense. The high cost of over-buying can be exacerbated by under-recording. Under-recording happens when busy maintenance professionals don’t manually update Computer Maintenance Management System (CMMS) inventories when shipments arrive. This is completely understandable. Maintenance teams are generally extremely busy and prefer performing maintenance to processing paper work. The paperwork is generally the last thing to be done and the first thing to be forgotten. Under-recording is generally revealed during cycle counts when shops discover that they have much more inventory than expected. It does not have to be like this. Closed-Loop MRO Procurement solutions automatically update the Quantity on Hand information in the CMMS when orders are received, freeing the Maintenance team from tedious data entry. When you need to order parts, how often do you fish out the last PO for those parts, change the dates and maybe the quantities, and then send it out again? Probably more often than you’d like to admit. While that is an easy way to re-order parts, it generally does not ensure that you get the best prices. But comparison shopping is hard, right? You have to send RFQs to multiple vendors and then compare the quotes that come back. That’s painful, right? It doesn’t have to be. This automation allows you to find the best prices for each order, resulting in lower purchase prices across the board. You’re insanely busy just keeping your operation running, right? You have plenty of work on your plate getting all the preventative maintenance done and handling the occasional emergency. You don’t have extra time to spend on procurement, right? We understand. A Closed-Loop MRO Procurement solution can actually save you time. Sending emails and leaving voice mails for purchase and/or payment approvals? Manually creating RFQs and POs? Manually tracking your pricing and maintenance contracts? Laying printed POs, invoices, and packing lists next to each other and checking items off with a highlighter to ensure that your order matches the invoices and shipments? A Closed-Loop MRO Procurement solution can automate all of that for you saving you lots of time. If you are purchasing $1M or more of parts each year, you are probably missing out on cost and time savings by using manual processes. If you’d like to know more about Closed-Loop MRO Procurement, we’d be happy to answer your questions. Contraqer Successfully Deploys Closed-Loop MRO Procurement Solution at Grassland Dairy Products, Inc.